Theoretical physicist Dr. Karin Everschor-Sitte will be setting up an Emmy Noether independent junior research group at Johannes Gutenberg University Mainz (JGU) with the aid of funding from the German Research Foundation (DFG). 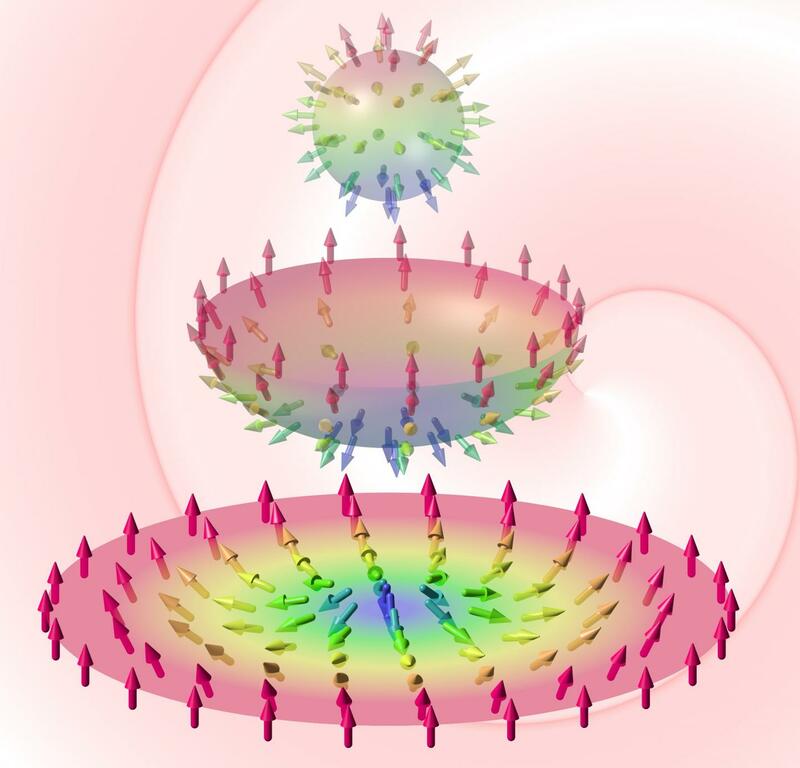 The work group TWIST – short for Topological Whirls in SpinTronics – will be looking at skyrmions. These are new magnetic 'particles' named after the physicist Tony Skyrme that could in future ensure that the storage media in our computers become smaller and more efficient. A skyrmion can be described as a kind of node or vortex within a magnetic texture. Skyrmions are characterized by the fact that they are more stable than any other magnetic structures and react particularly readily to spin currents. This is why skyrmions are considered to be of relevance to technological applications in the field of spintronics, a young physics discipline that is exploring not only the electronic charges of such particles, but also their spin, i.e., their magnetic properties. The objective of Dr. Karin Everschor-Sitte is to gain a deeper understanding of the interaction between skyrmions, magnetic structures, and spin and charge currents and to develop new theories that will enable her to make the best use of skyrmions in technological applications. Her future projects could produce some innovative concepts that would be of commercial interest. "We are delighted that Dr. Karin Everschor-Sitte will be contributing to our work in the field of spintronics," says Professor Jairo Sinova, Director of SPICE, the Spin Phenomena Interdisciplinary Center at Mainz University that, alongside the Emmy Noether group to be established in November 2016, is also affiliated with the Condensed Matter Physics (KOMET) work group of the JGU Institute of Physics. Through its Emmy Noether Program, the German Research Foundation supports young researchers in achieving independence at an early stage of their scientific careers by giving them the opportunity to head a junior research group and thus gain the qualifications required for a university teaching career. Independent junior research groups are usually funded for a period of five years. Dr. Karin Everschor-Sitte worked at the University of Texas at Austin in the USA from 2013 to 2015 and relocated to Mainz in November 2015. She will begin setting up her work group at JGU in November 2016.